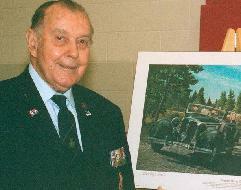 On Saturday afternoon, Oct. 18, 2008, Charley Fox, decorated war veteran, took off in his car from a Canadian Harvard Aircraft Association meeting near Tillsonburg, Ont., heading to another engagement. Sixty-four years earlier, on the afternoon of July 17, 1944, Fox took off in his Spitfire from the air force base at Beny-Sur-Mer, flying armed reconnaissance. Spotting a German staff car, he swooped down, firing and sent the car plunging off the road. It wasn�t clear until years later that the car carried German Field Marshal Erwin Rommel, aka The Desert Fox, who was wounded in the attack. It was just one of dozens of adventures Fox experienced during his wartime flying career, many of them cheating death and prompting him to ask, in later years, �why not me?� Why had he survived when so many of his comrades had not? On Oct. 18, that run of good fortune ended. Fox, 88, was killed in a car crash on an Oxford County road as he left the aircraft association meeting. The tragic incident left family, friends and fans wondering who will pick up the torch Fox has carried for the past two decades, as he honoured the memory those who never returned from the war by talking about them, about his experiences and about the realities of war to groups from seniors to school children. Fox was particularly dedicated to making the country�s military history and wartime contributions and sacrifices alive and relevant for young people, to make the history live for them. �It�s so important to expose them to this,� he said in a 2005 interview with Forever Young. As part of that, he accompanied school groups to the battlefields in Europe. In 2005, he participated in a youth conference in Apeldoorn, The Netherlands, with 59 students from nine countries, including 13 from Canada. In 2009, he had hoped to take a group of 50 air cadets to Poland to mark the anniversary of The Great Escape from Stulag-Luft 3, a piece of history on which Fox was a self-made expert. Even without trips abroad, Fox believed there was much that could be accomplished in the classroom. He actively promoted Torchbearers 2005, a project aimed at making the wartime history resonate with the younger generations. As part of that effort, he compiled a package of material for history teachers, to complement the secondary school curriculum, including an exclusive DVD � Peace and Freedom � a virtual tour of wartime combat from the Battle of Britain to Dieppe and more, with film footage of the conflicts. The package also included some of Fox�s own presentations and his personal stories. Fox was also actively involved with the Harvard Aircraft Association and in 2004 was named Honorary Colonel of 412 Squadron of the Canadian Air Force. He traveled frequently to Ottawa on veterans business and had a schedule packed with events in these days leading to Remembrance Day. Fox is survived by son Jim, daughters Sue and Adrienne and 12 grandchildren and six great-grandchildren. Late in the afternoon of July 17 1944, Charley Fox took off in his Spitfire from the air force base at Beny-Sur-Mer just inland from Juno Beach in Normandy, where just a few months earlier Canadian and British forces had successfully invaded on D-Day. Flying armed reconnaissance above a tree-lined road in the rural countryside he spotted a German staff car. Fox flew in a curving arc out of the blue sky, firing and sending the car plunging off the road. �I had no idea who it was� just a large black open car� gleaming in the sun, without any camouflage, which was unusual,� Fox says today. In fact, the car was carrying German Field Marshal Erwin Rommel, aka The Desert Fox, who was wounded and sent back to Germany, where he was eventually forced to commit suicide after being implicated in the assassination attempt on Hitler. Fox�s part in Rommel�s downfall was only officially confirmed a few years ago, largely due to confusion about the time of the attack, arising from the fact that the Allies and Britain were on double daylight time and the Germans and Europe on single daylight time. 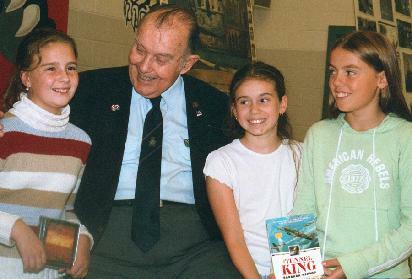 But once released, the incident became a part of Fox�s heritage and, as such, it�s one of the many stories he tells to audiences, ranging from elementary school children to retired Kiwanians in a presentation focused on raising awareness of Canada�s wartime history and particularly of its unsung heroes, many who never made it home. He�s been telling the stories ever since but, during the past year, it�s been with greater frequency as he promotes Torchbearers 2005, a project dedicated to making the country�s military history and wartime contributions and sacrifices alive and relevant for young people. �It�s so important to expose them to this,� he says, acknowledging that for a generation who has grown up in an age of computers, it�s critical to bring the history alive for them. And, for that, there�s nothing like the real thing. Fox participated in a youth conference in Apeldoorn, The Netherlands, with 59 students from nine countries, including 13 from Canada (one from each of the provinces and territories, including Nunuvut). �That was wonderful,� he says, and something he�d like to see more of. He hopes Torchbearers can promote cultural exchanges, such as one that arose from the twinning of a Burlington, Ont. secondary school with one in Apeldoorn. But even without actual trips abroad, there�s much that can be accomplished in the classroom setting, especially now that Canada�s wartime history is part of the secondary school curriculum, Fox believes. Torchbearers has compiled a package of material for history teachers to complement the curriculum. It includes exclusive aids such as an hour-long DVD called Peace and Freedom, produced in the eighties by the late Tom Charrington of CHCH-TV in Hamilton. The video takes a virtual tour of wartime combat from the Battle of Britain to Dieppe and more, featuring actual film footage of those conflicts. The package also includes some of Fox�s own presentations, which in addition to his personal stories include detailed information about the �Great Escape� from Stulag-Luft 3 � a piece of history about which Fox is a self-made expert. It includes support material in the form of books and other videos and a music CD � Lest We Forget � A Salute to All Veterans � produced by Fox for Torchbearers 2005 and featuring London, Ont., native singer Michelle Iurman. The package has a retail value of $500 and will be updated annually as new material becomes available, Fox says. But schools can get it free by becoming �Torchbearer Schools,� a designation achieved by selling $1,000 worth of Torchbearer merchandise, including T-shirts, caps and cravats with the unique Torchbearer 2005 logos plus the CDs and wrist bands. The merchandise is part of the fundraising strategy to support the project which Fox has already sunk $47,000 of his own money into, with little support from any level of government, despite initial enthusiasm and promises from Veterans Affairs and London MP Joe Fontana. Recently the Canada Remembers arm of Veterans Affairs has committed to purchase 500 CDs to distribute to schools and libraries in the London region, where the project has taken root with both public and Catholic school boards supportive, Fox reports. But he�d like to see the project spread across Ontario and even across the country. Half of the proceeds from the CDs and wrist bands are earmarked to fund annual seminars at universities around the country for teachers, student teachers, university history students and possibly high school students sponsored by a history teacher. These would involve veterans as guest speakers, workshops and round-table discussions. �We have to look to the future while keeping the past alive,� he says.